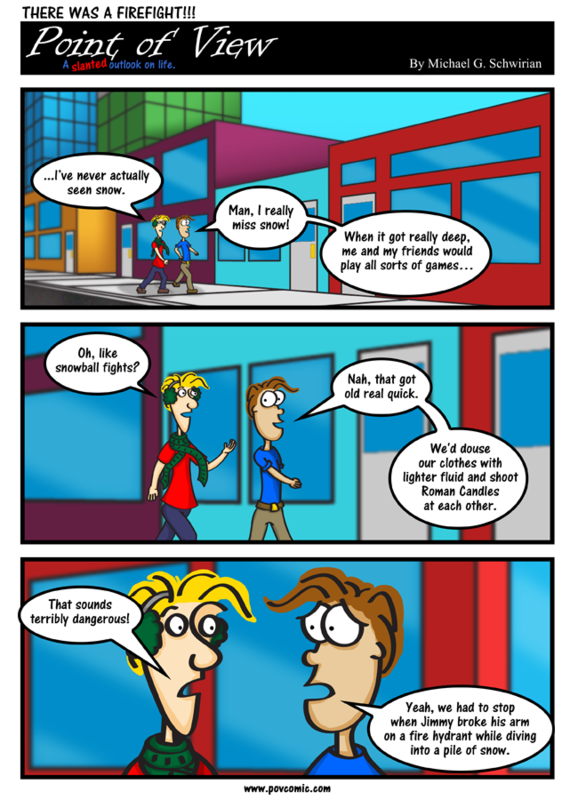 Point of View Comic - THERE WAS A FIREFIGHT!!! The Snow story from today’s comic was inspired by my friend Carl Middleton – Based on actual events from his childhood. Thanks Carl! Also, don’t try this at home…. In the eternal words of the Family Stark – Winter is coming… finally. Here in San Antonio, we’ve yet to have a full week of jacket weather… I for one am looking forward to it. Wow! That is a really nice looking background you have there! What is with boys and lighting things on fire? 😀 Next episode: The beautiful background burns to the ground!!! !